My mother was a grade school teacher for over 35 years and always thought I would make a good teacher. I saw how little money she made and decided to enter another profession. Much later I learned that it’s not about the money! I became involved in ACTIVSTARS when the Kansas City Office first opened. My daughter brought home a flyer from school, and although she wasn’t interested in signing up right then, my 4-year-old son was very interested. My wife, Kim, and I signed him up and I became a parent helper. Kim and I were eventually accepted as private students by Sensei Kraig Hollingworth and formed an adult class, working out in his basement. After receiving our Black Belts, I was fortunate enough to become an instructor for this great organization. 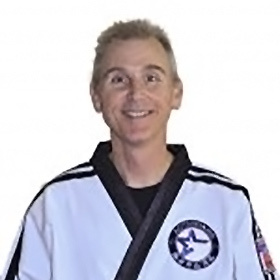 I have now been an instructor for over 18 years and enjoy teaching more than ever! Yes, my mother is proud of me! Both of my children spent years in this program, so I can relate to the experience from a parent’s perspective. I encourage all parents to sign up as parent helpers, so they can see the program work from the inside as well as have a better understanding of how to help their children practice. I have fond memories of studying Judo at the local YMCA when I was in grade school. I still remember how special my instructor made me feel when I learned something new, so I can relate to the experience from a student’s perspective. I try to impart that special feeling to all my students as well.